Motorola just launched its third Android-powered smartphone with a name that describes its unique characteristic. 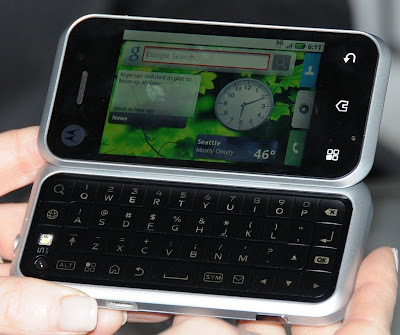 --The Backflip, a phone with a physical keyboard that opens up in the reverse direction. That feature is no gimmick however as it allowed Motorola to add a bigger keyboard than would otherwise be possible. In addition, it gives the phone the ability to fold up and sit on a tabletop transforming it into a bedside clock. The Backflip will try to surpass or at least equal the success of Cliq (Dext) and Droid with its own good looks and innovative features. The two previously released Android smatphones have really revitalized Motorola's struggling handset business and they hope that Backflip will ride the momentum. This latest Android smartphone has the right goodies to make us drool. Aside from its back-flipping, well-spaced QWERTY physical keyboard, it also has a 3.1-inch touchscreen and a 1-inch touchpad behind the screen. The trackpad is sensitive to gestures like tapping and swiping making it useful for web browsing or even gaming without the user's fingers obstructing information displayed on the screen. Motorola has been planning to release APIs that will allow developers to use this touchpad in creative ways. Using Android 1.6, the Backflip's user interface is similar to that of the Cliq. It also has a custom-made skin by Motorola called MotoBlur that aggregates social networking information, e-mail contacts and the phone address book. It is worth noting that the OS is upgradable to version 2.1, which is currently being used by Google Nexus One. Other important hardware features of the Backflip that we know of include a 5-Megapizel camera (capable of video recording) with digital zoom and LED flash, WiFi, Micro USB slot and Bluetooth among others. We currently have no information regarding the processor that powers the handset. Motorola hasn’t announced the price and availability of the Backflip just yet. But there are reports that it would cost the same as Cliq and it will be available to consumers this first quarter of 2010. All things considered, I think the Backflip will defy expectations and will help further increase the popularity of Android-powered smartphones this year.